Tonight I made chicken and orzo. It was really good. 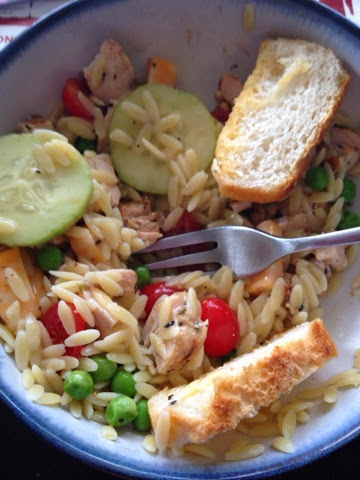 I made orzo and peas for the kids, which by the way they both ate a whole bowl of, then I added grilled chicken, cucumbers, cheese and tomatoes to and some Greek dressing. It was great and really simple. Thursday and Friday are still being decided. Mike has those days off so we will probably make something a bit more time consuming since we will have time to cook. I'm also baking oatmeal rasin cookies with Evelyn tomorrow. Oh and I'm going to slow cook corn beef for sandwiches this week too.